Washington - Attorney General William Barr has made his determination about special counsel Robert Mueller’s investigation . Now Democrats want to make their own. Mueller didn’t find that President Donald Trump’s campaign “conspired or coordinated” with Russia to influence the 2016 presidential election, but he reached no conclusion on whether Trump obstructed justice. Barr decided there was no evidence requiring prosecution on the obstruction issue. Trump claimed full vindication, but the delivery Sunday of Barr’s summary to Congress about Mueller’s conclusions opened a new chapter in the battle over the two-year investigation that is likely to consume Capitol Hill in the coming weeks and months. Democratic lawmakers are demanding a full look at Mueller’s findings and dismissing Barr’s summary as incomplete, at best, and biased, at worst. 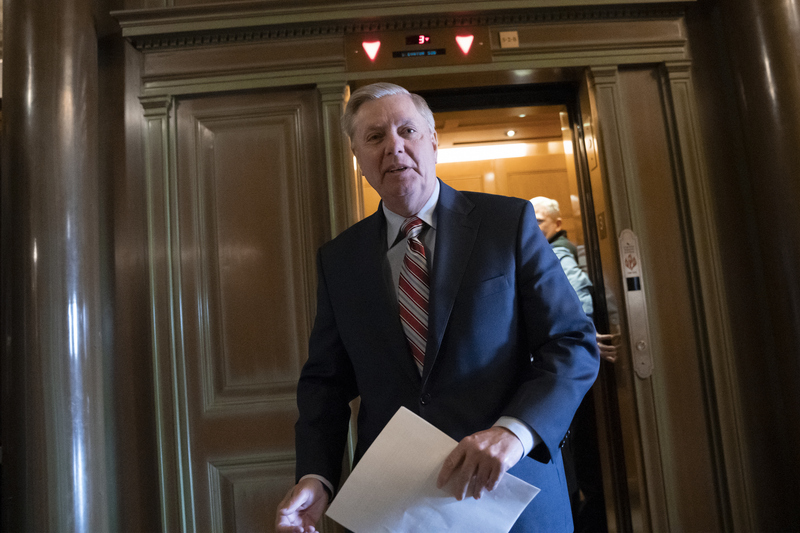 On Monday, a leading Republican senator previewed his party’s strategy, defending Barr’s decision and vowing to “unpack the other side of the story” of the Russia investigation. Sen. Lindsey Graham, the Senate Judiciary chairman who spent the weekend with Trump in Florida, said his committee will investigate the actions of the Justice Department in the Russia investigation, including the FBI’s use of a dossier compiled by British spy Christopher Steele. Graham’s comments echoed Trump’s own complaints Sunday in which he compared the probe to a failed coup and said those behind it should be held responsible. On Capitol Hill, Democrats have seized on a line in Barr’s summary that says Mueller’s report “does not exonerate” Trump on obstruction of justice — even though Barr concluded the evidence of obstruction is insufficient to find Trump committed a crime. Monday morning, White House aides and allies blanketed television news broadcasts to trumpet the findings and claim that Trump had been the victim in a probe that never should have started. Given the report, Democrats seemed more likely to focus on their ongoing investigations, calls for transparency and frustrations with Barr, rather than engaging with the talk of impeachment that has been amplified on Pelosi’s left flank. As the release of Mueller’s report loomed, Pelosi recently tried to scuttle that talk by saying she’s not for impeachment, for now. Yet while Democrats focused on the obstruction piece, Barr’s summary report dealt their investigative efforts an undeniable blow by concluding that Trump’s campaign never conspired with Russia. Top Democrats, now leading broad investigations of Trump in the House majority, had long suggested just the opposite. Democrats discussed strategy in a flurry of calls over the weekend. Pelosi and Schumer talked repeatedly, including several calls Sunday from her home in San Francisco. As soon as Barr’s letter arrived, Pelosi quickly convened a call Sunday with Cummings, Schiff and Nadler to go over its main points. They were on the same page with their response, according to a person familiar with the call. Nadler later held a conference call with Democratic members on the Judiciary panel and reiterated calls for transparency. Republicans unified to call for Congress to move on. “This case is closed,” said House Republican Leader Kevin McCarthy in a statement. Trump celebrated the findings but did not appear ready to let the matter drop, calling the investigation “an illegal takedown that failed.” He said that, “hopefully somebody’s going to look at the other side,” an apparent reference to Democrats. It’s unclear what else is coming from Barr, though he states in the letter that he is working to make more information public. He said he will be consulting with Mueller to determine what else can be released. But whatever is provided is unlikely to be enough for Democrats, who have said they want all of Mueller’s underlying evidence — including interviews, documents and material turned over to the grand jury. Though Trump himself has said the report should be made public, it’s not clear whether the administration would fight subpoenas for testimony or block the transmission of grand jury material. Release the full report and let both sides investigate each other. The snake mueller couldn’t find any crimes in Trump, to his dismay, so he decided to leave dems with a gift: he left the door open about supposedly not being able to decide either way about obstruction! And now dems run with their next witch hunt...it’s ok, smart and honest people see right through them and they’ll pay at the polls. Trump is a shoe in for 2020! These wasted two years of unfounded investigations could have all been avoided had Trump's first Attorney General done the proper move instead of appointing this cholera Mueller as a special prosecutor and investigate. What a waste of time, money, prestige and so much else, to say the least,the fools..